As we looked back on 2014, two sport sedans stood out as some of the best. 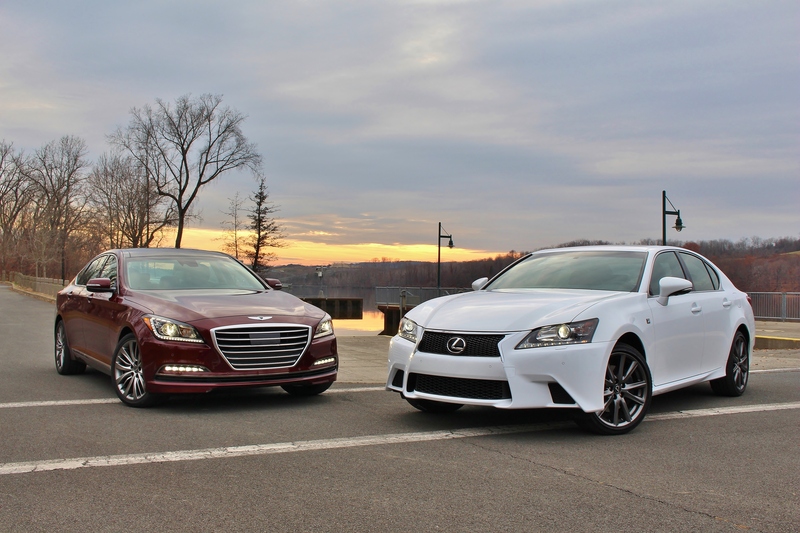 The Lexus GS has made several appearances, both in GS350 AWD and GS450h forms, in the Limited Slip Blog garage. Luxury abounds in this Lexus. And with 306hp on tap, there’s plenty of sport in this sedan as well. The Hyundai is a different story. In the deserts of Arizona, we met the most improved car of the year. 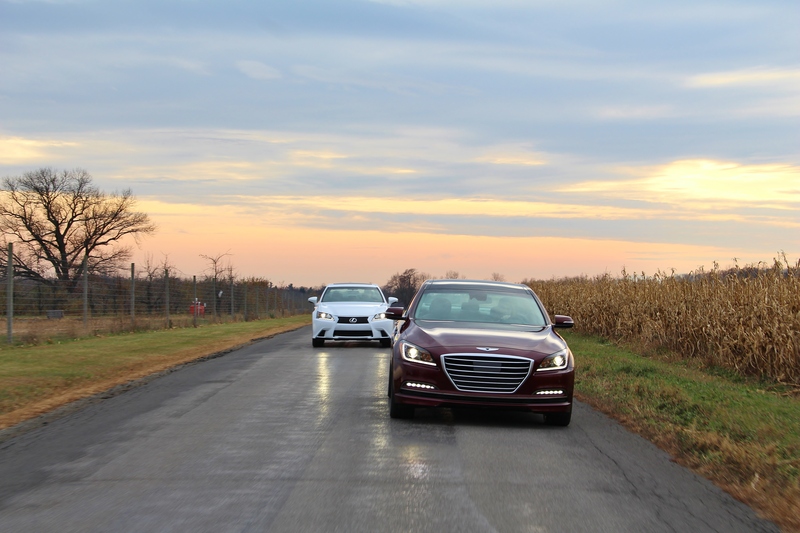 We were heartily impressed with the new Genesis. The 3.8L V6 offers everyday practicality with HTRAC all-wheel drive and a chassis tuned with the help of Lotus. But the 5.0L V8 is where things get more interesting. Adding over 100 hp to the mix really livens up the driver’s seat. This got us asking the question. 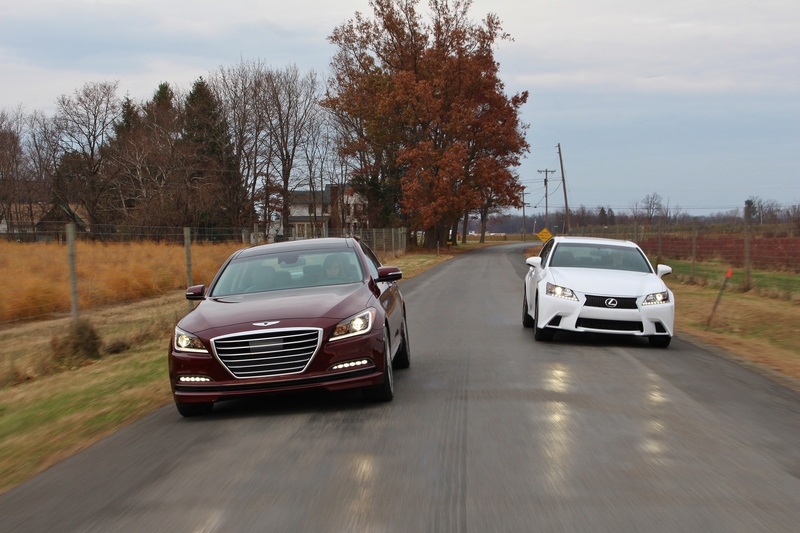 If we pit them head to head, which mid-size sport sedan would we like best? On paper, this doesn’t look like the most even comparison. The GS350’s F Sport package equips sport-tuned suspension components for more precise handling. To level the playing field, we felt it necessary to step up to the Genesis 5.0, which includes Hyundai’s Continuous Damping Control. The system, which has a Sport setting, is only available with the V8. But that left the Genesis with a fairly substantial power advantage. Other powertrain differences would also have an effect. The Hyundai arrived with rear-wheel drive and an 8-speed automatic compared to the Lexus’ 6-speeds and all-wheel drive. As for the $5,600 price difference? We’ll get back to that. Looks are subjective. But if you ask us, the Genesis comes across as more modern with its squarer hood and tasteful bright-work. The GS, with its darker wheels and F Sport body kit, stands more aggressive. Both cars use plenty of LEDs to convey that luxury appearance, but the Hyundai’s large orange DRL’s make it look like a 90s Pontiac during the day. Out of the back of the chase car, they both look svelte on the move. The Hyundai is nearly 6 inches longer than the Lexus. All that extra space is between the wheels, giving the Hyundai a slightly more spacious interior by the numbers. In reality, the GS350 has more rear leg room and the Genesis has a wider rear passenger space. There’s no definitive space advantage between these two, but sitting inside is where you start to notice the differences. From a usability perspective, the Genesis’ infotainment tech is far superior. Lexus’ antiquated Remote Touch knob controls the clunky Enform system on a massive 12.3″ screen. Despite having a 3″ size advantage over the 9.2″ touchscreen in the Genesis, it never acts as a single display. That makes it appear smaller. But when you feel the touchpoints and interact with the cabin controls, things start to favor the GS again. Lexus’ build quality and attention to detail are the industry benchmark. We’re not implying that the Genesis feels cheap inside, but there are places where the Hyundai’s plastic can’t match the leather-clad Lexus. If you’re in it just for the luxuriousness of the experience, the GS350 gets the nod. Inside, these two sport sedans are split. The Hyundai is better suited for a more tech-savvy driver. The Lexus, on the other hand, is geared towards an owner that enjoys the finer things. We’ve acknowledged the disparity in the numbers already. But when the Genesis arrived a day ahead of the Lexus, we were worried that we might have set up an unfair comparison. 420 horsepower is one thing, but it’s the 383 lb-ft torque at 5,000 RPM that urges the Genesis forward with alacrity. 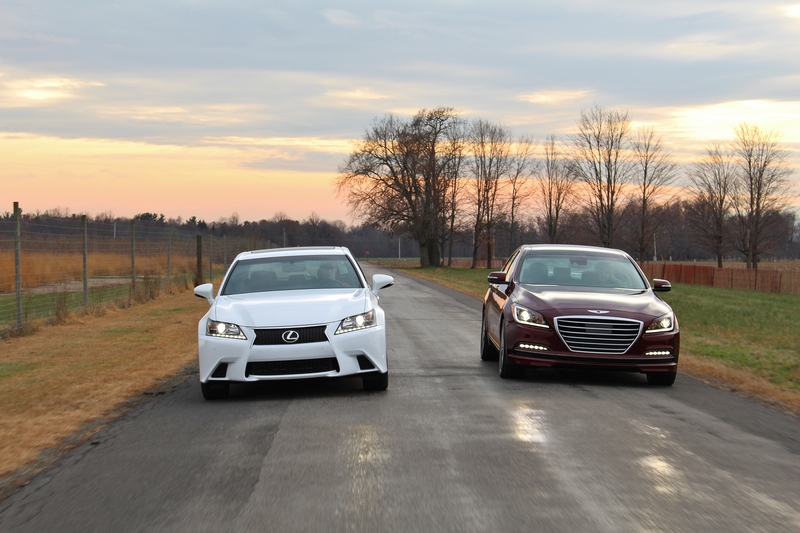 In a straight line, the Hyundai gallops away with a V8 rumple that the GS350 can’t match. The F Sport models receive a unique sound generator in the intake. The extra noise is sporty, if artificial at times. The GS is not slow by any definition. 60 mph arrives in 5.7 seconds. The biggest problem is the AWD GS is saddled with the 6-speed automatic instead of the rear-drive 8-speed. The GS’ engine is punchier at higher RPMs. Output peaks at 306 hp and 277 lb-ft torque. But with only 6 gears, it spends less time where it shines most. Life in the upper Hudson River Valley is full of wide open spaces and sweeping elevation changes. It’s the perfect topography to test the handling of these two. When the test day finally arrived, we mapped out a winding set of county routes. Both cars cover ground with comfort and grace, but how would they react as we push the dynamic limits? Dialing the Hyundai into “Sport” alters the steering and shift logic and stiffens the electronically-controlled suspension. In the GS350, the same result is enabled with the “Sport+” setting. Both cars tighten up nicely. 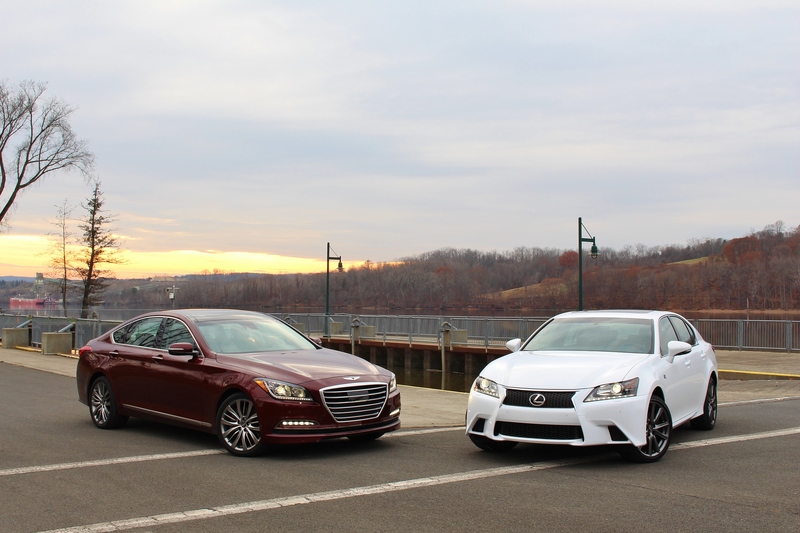 But the wheel in the Genesis doesn’t have much grip compared to the contoured and very sporty wheel in the GS350. Needless to say, the Hyundai leaves our hands disappointed. What Hyundai has done with the new Genesis is build a new generation of luxury car. A 5 Series or E Class owner won’t be turning their keys in for a Hyundai anytime soon. The “old” luxury still has that extra little something. There’s a level of brand recognition and status and expectation in the “old” luxury offerings. If we’re honest, there’s still an edge on material quality as well. The kind of owner that appreciates that couldn’t fathom spending $55k on a Hyundai. But the Genesis arrives without any preconceived notions. There isn’t any status or image associated with it; the Hyundai badge doesn’t carry any baggage. For the “younger” luxury buyer, that fact alone is very much an advantage. So which one was our favorite? We want to drive the Lexus GS350 F Sport. It might have lost the technical and power battles, but it made ground up in every corner. With confident brakes and a demeanor that makes you smile just a little bit more, it won us over. The Hyundai Genesis is 9/10ths the car dynamically. It was difficult not to give it the nod. 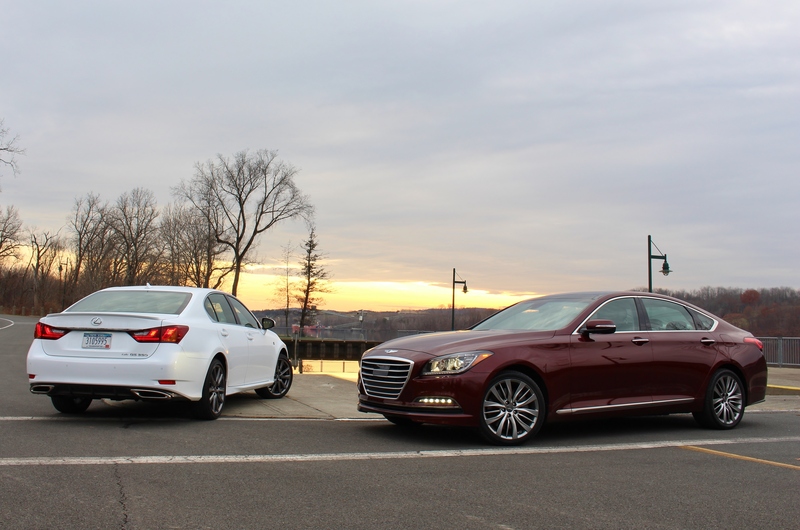 More intuitive interfaces, a 5-liter V8, and the as-tested price advantage all benefit the Genesis. And while this is a win for the GS, it almost feels like a victory for Hyundai. In a little over 6 years, Hyundai has very nearly matched the quality and characteristics that Lexus have been perfecting for over 20. So while we might be out driving the GS, Lexus better be checking their rear-view mirror. Don’t forget 5 years or 60K miles bumper to bumper warranty on the Genesis. Have had two 5 series BMW’s, finally did the test drive and yes, I bought a Hyundai. The Genesis has more room, more power and I am not nickel and dimed all through the purchase process. Also I have over 400 horsepower and can use regular gas. BMW, pleather seats were standard, turbo 4 cyl (yes on the 5 series), upgrade to higher end stereo, $500 for heated seats and on and on. The Genesis comes loaded, everything, and cost me $25.00 for an oil change versus $135.00. The Koreans have caught up, not only with the models from Japan, but also Germany. This is from someone that has driven them for years, not a few days or week. Nope. Still a cheap imitation of the Japanese pursuit of perfection. Always will be.